← f164. My new Journal. Silver Waves of Grain. | Near Moses Coulee in Central WA | This image is available in print. Making landscapes comes with the privilege being able to focus on one subject. Unlike with a wedding, where I need capture a multitude of stunning images, the goal with fine art is a single frame. Lately I’ve been focusing on the idea of a large effort going towards the single frame. Sometimes the more work it takes, the more pride I feel for the piece. I am satisfied with this and it will probably appear in my Signature Collection as a 30-40 inch piece. That does not happen every time I go out, so I’m happy. It’s a simple landscape, yet it embodies northwest farming without clutter or distraction and does so in a way that I think in unique, the sea of blurred grain surrounding the lone family of grain bins which will soon have their bellies filled with the very ocean that surrounds them. Long exposures have long fascinated me. When I went to make this frame I did it with intent. 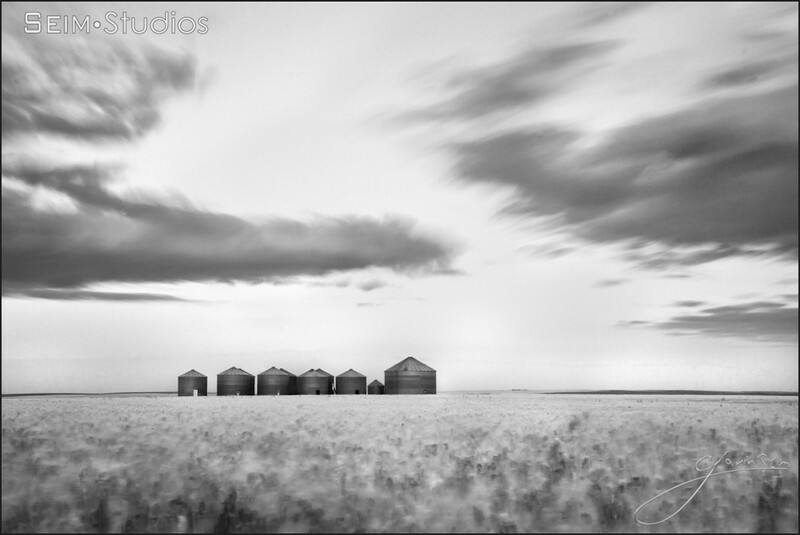 I knew that my goal was to capture the wheat in some form and to use my B&W 110 ND filter to achieve a long exposure. I just didn’t know exactly the approach I would take. I had my family with me and we drove up to the area where I grew up. I know the fields pretty well around here. Sunset was drawing in and I was at that stage where I felt I needed to pick my spot now. I recalled this old windmill that sat in a field down a nearby gravel road. As we were driving there however, I saw these grain bins that I had seen hundreds of times over the years and ignored. I was reminded that I often fall into the trap of looking for something great, only to miss the ordinary that is equally beautiful. 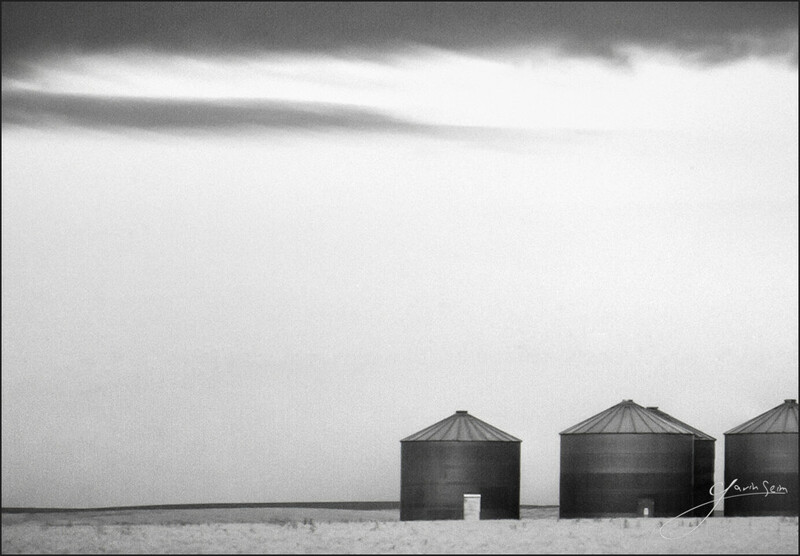 Everyone photographs windmills, but everyone ignores these stubby little grain bins. I backed up the road watching how the bins edges crossed over one another, finally deciding on this spot. For better or worse, this was to be my final image of the evening. The summer air was warm and there was a gentle breeze. That was good because I wanted to blur the surface of the wheat. I setup my tripod few yards into the field and started carefully playing with compositions and a few test shots, then looking at exposure readings and using an iPhone app called Perfect Shot to determine exposure with my 1000x darkening filter (the camera won’t meter this far down). The sun was just down and I had time for about one more. I did my calculations and fired off for a 5min 30sec exposure. I was getting a little noise in previous frames so I turned on long exposure noise reduction in which the camera captures a matching black frame to find and remove noise. It also doubles the time. It took over ten minute for the frame to be ready. to view. I was done for the evening. On arriving home I had a few prior frames to look at, but I knew this final was where my hopes resided. It looked good. I started processing in LR and playing with my presets as I nearly always do to start off an edit. Using Monochrotaix presets I settled on a monochrome process that fitted the scene (better in my opinion than color would have). After finding a look I liked I went deeper working the channels. Over the next few days I went to PS for additional detail work and cleanup, taking breaks in between for other projects and to gain perspective. I actually used two channel mixes. 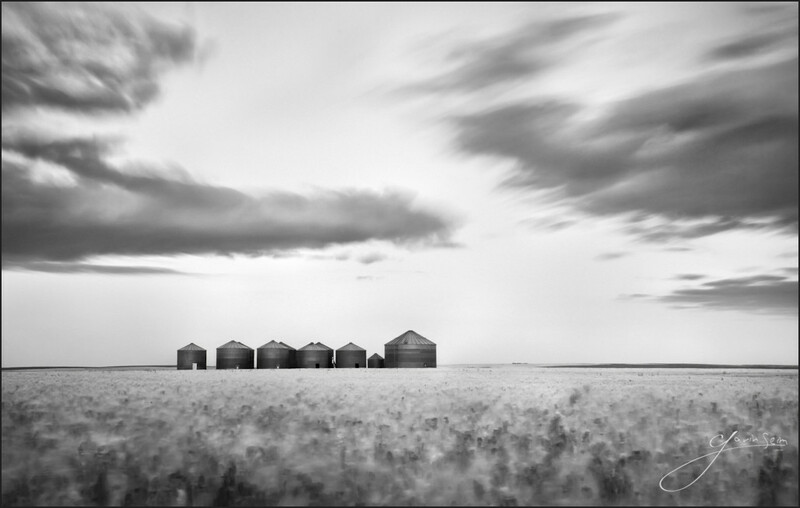 I wanted what would be the blue in the sky to be dark, but the tops of the bins to retain their texture and lightness. I made one primary edit with the blues dark and another copy I made the blues light, causing the bin tops glow a little more. In PS I carefully masked the primary frame out to the light frame, adding to the light on the bins. I also removed some power lines right along the barely visible road. I debated leaving them in, stretching silently and giving a modern feel to a western scene, but in the end simplicity won the battle and decided against it. 01.22.11 process refinement: So it’s moths later and I’m working on prints for this. I realized that even though I tried to be clean in my processing, there was still a lot of crud in my skies. More noise that there should be. I tried noise reduction tools, but I could not get this un-natural crud out without blurring my whole image. I opted to mask the area and carefully paint over it with a digital brush, using the matching color of the sky and carefully blending until the bad was gone and replaced with clean graduations. I talked about this process on Pro Photo Show #74. It’s versatile and can be used on anything from portraits to long exposure landscapes like this one. It just takes some subtlety and time. In this case I separated the horizon and below from the sky, using the magnetic lasso. Then I set a soft round brush to around the 30% opacity and gently painted on the noisy area of the sky until the artifacts were gone. I also used a little noise reduction on the whole sky to give me a clean consistent appearance. The first process. It looked good until I demanded a close detail inspection for myself. Pretty messy and a lot of noise in that lower sky. In a 32 in print it stood out. The refined process. Now this is more like it. It's a tad softer now, so I'll sharpen a bit before printing to bring a touch more detail into the grain and bins. This entry was posted in f164, journal and tagged art, bins, canvas, central, f164, farm, gavin, harvest, print, silver, sunset, washington, waves, wheat. Bookmark the permalink. Stunning image. Long exposures offer something so different. I am surprised at the quality of a 5 min. exposure with a DSLR. I have been trying to achieve this type of look for a long time and have been reverting to good old B&W film. I was under the impression that you should not try for a long exposure (over 30sec.) on a DSLR. something about the sensor over heating. Well from the looks of this I am totally wrong. I am going to try it. You have achieved a one of a kind image that you should be proud of. It screams American history and hard work as well as beauty and solitude. Thank you for sharing this wonderful picture.